The National i-THRIVE Community of Practice (CoP) is made up of a wider set of sites across the country that are working to implement the THRIVE Framework in their services for children’s mental health. i-THRIVE CoP members attend events regularly to share learning about implementing the THRIVE Framework. Members receive guidance and direction from the i-THRIVE partner organisations – the Anna Freud Centre for Children and Families, UCLPartners, The Tavistock and Portman NHS Foundation Trust and the Dartmouth Institute for Health Policy and Clinical Practice. The National i-THRIVE Community of Practice sites are responsible for over 62% of the population of children and young people in England. The map below demonstrates the geographical extent of the i-THRIVE CoP. Visit the i-THRIVE COP snapshots page to learn more about some of our i-THRIVE Community of Practice sites. The orange stars indicate the ten national accelerator sites. The purple stars indicate the Community of Practice sites. 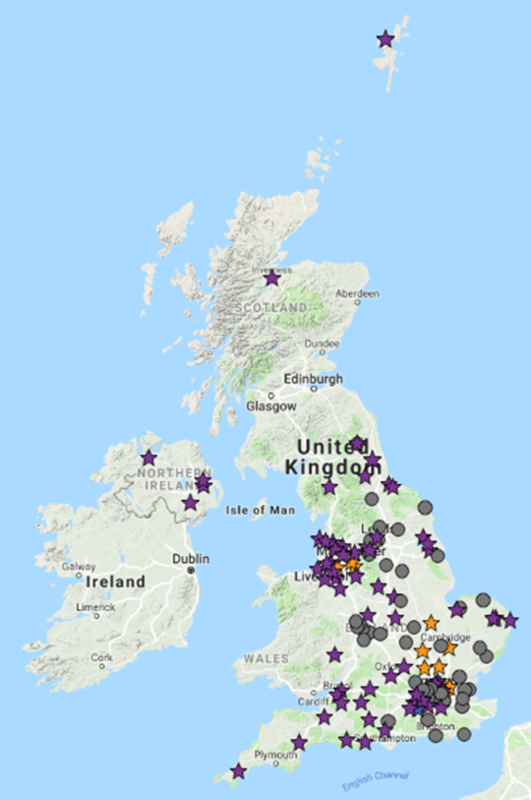 The grey circles are members of the i-THRIVE Community of Interest who are receiving updates about the progress of i-THRIVE. If you are interested in joining the i-THRIVE Community of Practice or would like to find out more about what the Community of Practice can offer please contact Bethan Morris, i-THRIVE Research Officer at bethan.morris@annafreud.org.